A squared plus b squared equals c squared. It sounds simple, doesn’t it? 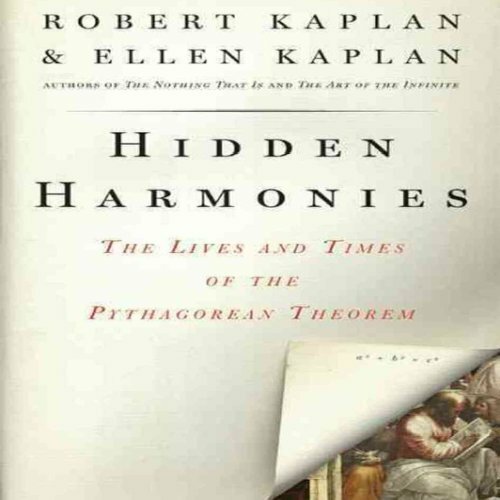 Yet this familiar expression opens a gateway into the riotous garden of mathematics, and sends us on a journey of exploration in the company of two inspired guides, Robert and Ellen Kaplan. With wit, verve, and clarity, they trace the life of the Pythagorean theorem, from ancient Babylon to the present, visiting along the way Leonardo da Vinci, Albert Einstein, President James Garfield, and the Freemasons - not to mention the elusive Pythagoras himself, who almost certainly did not make the statement that bears his name. As in the authors’ best-selling The Nothing That Is and Chances Are..., the excitement of mathematics leaps from the pages of Hidden Harmonies. ©2011 Robert and Ellen Kaplan (P)2013 Audible, Inc. The text version of this book probably contains three equations and two illustrations per page. The stalwart narrator is constantly reading some text and then saying, "Illustration." He also has to plod through hundreds of equations which he clearly doesn't understand. Whoever chose this as an audiobook probably didn't read it or even look at it. However, I'm glad to have it in this format. While I can't be more than about five minutes from consulting the text version on Kindle, or better yet, in the paper book, the audiobook allows me to take my eyes off the text for short periods of time while I'm shaving, waiting for the train, etc. It is an eclectic history and discussion of the Pythagorean theorem written in an off-the-wall style that I, for one, enjoyed, e.g., "… we needn't carry rigor as far as mortis in order to satisfy our legal longings and understand better what we want of a proof." This is, I am quite sure, an absolutely brilliant book, but it just does not work in audiobook form. Not for me anyway, I am not able to follow without consulting the apparently numerous illustrations of the printed version. Giving up after a chapter and a half! Wonderful narrator by the way, will check out his other work! The print version is probably great, but long lines of numbers, letters and equations do not work on the audio book. if you are not a mathematician, this isn't going to be a read that helps you understand much. makes the case that Pythagoras didn't invent his famous theory. also has so many mathematical examples that it's hard to follow without being a mathematician.